The best rescue plan for Detroit: more power for bankruptcy judges. Congress should give more power to bankruptcy judges. 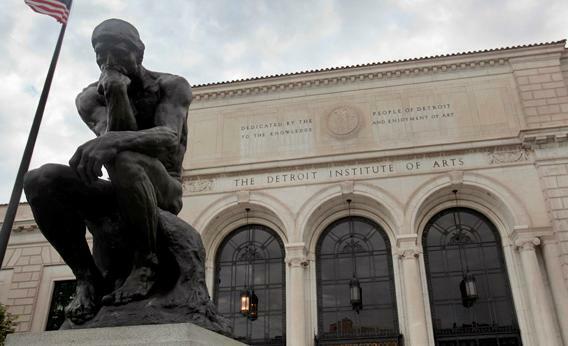 It’s OK. Detroit’s fine art is safe for now. But it’s problems are far from over. Detroit’s bankruptcy filing was unavoidable and largely sensible. But it will help that wounded city little. Detroit’s problems are deeper than its inability to pay its debts. And municipal bankruptcy law gives the courts too little power to impose the radical reform the city desperately needs. Detroit submitted a petition under Chapter 9 of the bankruptcy code, which contains the rarely used provisions for municipal bankruptcy. As a result of the filing, Detroit can block lawsuits by creditors who seek to be paid before they start seizing city property like zoo animals and priceless Renoirs, and the city make all creditors take a haircut on the loan payments they are due. Those creditors include, most prominently, current and former city workers to whom Detroit owes pensions. And they include suppliers and bondholders—people who lent money to Detroit in return for a promise of repayment plus interest. Municipal bankruptcy bears a superficial resemblance to corporate bankruptcy. The city or company can’t pay its debts, and a court orders the debts reduced, so that revenues (from sales, for corporations; from taxes, for cities) can service the rump portion. As Matthew Yglesias explains in Slate, corporate bankruptcy is a useful legal mechanism, not a plot device in a Dickensian morality play. The same should be true for municipal bankruptcy. But corporations and cities are not the same, and their differences are reflected in the law. For one thing, it is easy to tell whether a corporation is insolvent or not. The answer is yes if the company cannot generate enough revenue to pay its debts and the value of its assets—the amount equipment can be sold for, say—is less than that. With a city, however, the main asset is the city’s ability to raise money from taxpayers, which in turn depends on their willingness to elect a government that taxes them. If taxpayers don’t trust their leaders, or know that the city’s debts may be forgiven in bankruptcy, they will be reluctant to agree to tax increases to pay those debts. But the taxpayers could also see the city’s finances in a rosier light. There is always thus a fundamental ambiguity as to whether a city is really insolvent. Consider, as an unhappy analogy, Greece. Controlled by a venal and incompetent government for many years, the country took on a huge debt burden. When Greece threatened to stop servicing its debt, creditors could not be sure whether Greek taxpayers couldn’t pay more, or just wouldn’t, preferring instead to be bailed out by the Germans. Other European governments thus were willing to extend further credit to Greece only if the country would reform its political system to raise taxes and (more to the point) enforce its tax law. The Greek political elite has tried to comply, but the public opposes austerity, and the country lurches from crisis to crisis. And so cities will be tempted to use bankruptcy to reduce their debts even when they can pay them, hoping that the bankruptcy court will accept the claim that taxes can go no higher. But this means creditors will often be unwilling to extend credit that the city will need when it emerges from bankruptcy. By contrast, corporations are generally forced into bankruptcy by their inability to pay their bills. For them, bankruptcy is an ill to be avoided because it typically wipes away the shareholders’ stake—and managers have a duty to maximize shareholder value. Understanding that bankruptcy is a last resort of corporations, creditors are willing to lend to them even after they emerge from bankruptcy. Cities may also be more attracted to bankruptcy than corporations are because, while bankruptcy judges have the power to “reorganize” a corporation—by ordering it to sell assets, or divide into two, for example—Congress did not give bankruptcy judges the same power to “reorganize” a city. A court can’t fire the city’s leaders, or bisect the city, or sell buildings, or put more money into collecting taxes or stopping corruption. As the law professors Michael McConnell and Randy Picker argued (subscription required) many years ago, this is a serious deficiency in Chapter 9. Detroit’s current inability to pay its debts as they come due is the least of its problems. Indeed, that is just a symptom of a larger, all-too-evident malaise—the loss of the industrial base, the shrinking of the population, and a corrupt political culture. The first two problems strongly suggest that the city, like a bloated corporation, should be shrunk. A smaller government should have responsibility for a smaller and more densely packed urban area, while people in outlying areas make do with suburban or rural governments, or move away. And to deal with the problem of corruption, ideally a court would replace the city’s leaders with proven and experienced managers, just as the incompetent management of a bankrupt corporation can be easily scuttled. Thus once again, the superficial appeal of bankruptcy for a city ultimately works to its disadvantage. Creditors lend money to reorganized firms because they trust the new management and see improved operations that provide a secure source of revenue for interest payments. There is a sense that the reorganized company is entirely new—it just inherits a brand and other useful assets from an old firm that has been eliminated. When Detroit emerges from Chapter 9, it will have fewer debts, but it will be the same old city: still too big and spread out, still mismanaged. Creditors will see new loans as just as insecure as the old ones, and will charge a high interest rate or not lend at all. In this sense, Detroit is not like American Airlines or General Motors. It is much more like, as I said, Greece. If Detroit is discharged from paying its debts while failing to transform its government and economy, bankruptcy may hasten its downward spiral rather than halt it. More disquieting similarities: The Greeks resent the influence of the Germans, while Detroit, whose residents are mostly black (83 percent), finds itself under the control of state legislators who represent a state that is overwhelmingly white (86 percent). Mutual suspicion among Greeks and Germans has interfered with efforts to resolve the Greek crisis. Racial politics may similarly sow distrust between Detroit and Lansing, weakening the ability of the legislature (which currently runs Detroit through a caretaker) to impose fundamental reform. Fortunately, there is also a significant difference. Federal courts have a reputation for impartiality, and so a federal bankruptcy court may the credibility to restructure the city. But first the bankruptcy courts must be given that power. Congress should revise Chapter 9 so that federal bankruptcy courts can fix cities the way they can fix corporations. It may be too late for Detroit. But for other cities saddled with enormous pension obligations, and likely to follow Detroit down the bankruptcy path, changing the law still can do much good.